US President Donald Trump has decided to scrap a programme that protects young undocumented immigrants, according to reports. 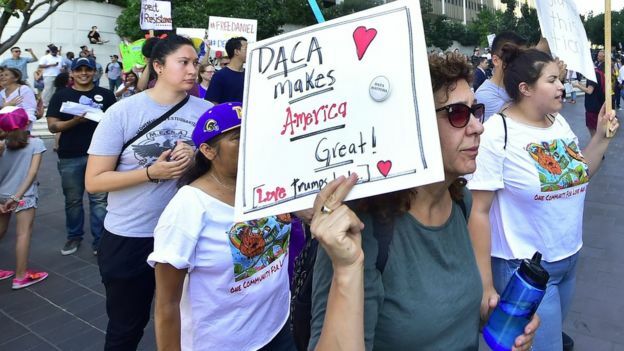 He will give Congress six months to draw up legislation to replace the Deferred Action for Childhood Arrivals (Daca), sources quoted by US media say. The decision, first reported in Politico, is considered a compromise amid strong support for the scheme. However, the sources cautioned that Mr Trump could still change his mind. He is due to formally announce his decision on Tuesday. The Obama-era Daca programme protects hundreds of thousands of so-called “Dreamers” from deportation and provides work and study permits. Candidate Trump promised to do away with Daca, and it appears that’s what he’s going to do, despite warnings from a cross-party collection of politicians. Or, knowing this president, those objections from “the establishment” only make him more determined to act. Fortunately for him, unlike repealing Obamacare or building his Mexican border wall, he doesn’t need Congress’s help here. In fact, by setting a six-month fuse on Daca’s destruction, Mr Trump puts all the pressure on legislators if they want to protect undocumented immigrants who entered the US as children. While the votes may be there for some type of fix, Congress already has its hands full with other pressing issues – hurricane relief, budget resolutions, the need to authorise new government debt and, at some point, tax reform. Mr Trump may not care, but he’s putting Republicans with tough re-election races in a difficult spot. If the president’s Daca bomb goes off, they will face angry constituents just as the campaign season gets into gear. The president, however, satisfies his anti-immigration base with this move – and washes his hands of the matter. The loyalists who have stood by him are rewarded, others in his party be damned. According to Politico, the White House informed House Speaker Paul Ryan of the president’s decision on Sunday morning. Mr Ryan last week urged the president not to scrap the scheme, arguing it left many young people “in limbo”. “These are kids who know no other country, who were brought here by their parents and don’t know another home,” he said. Mr Ryan is one of a growing number of Republican lawmakers and business leaders to speak out against scrapping the programme. While campaigning for office, Mr Trump took a hard-line on immigration and said he planned to “immediately terminate” the Daca programme. But since then he has said he finds the subject “very, very tough”. He said he intends to show “great heart” in dealing with what he described as, in many cases, “incredible kids”. The decision to give Congress six months to draft an alternative is seen as a compromise after Republican lawmakers and business leaders from companies including Google, General Motors and Microsoft urged Mr Trump to retain the programme. 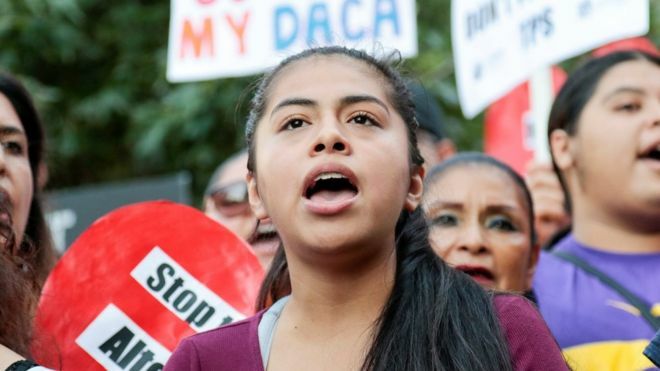 The Daca programme protects roughly 750,000 people in the US from deportation and provides temporary permits for work and study. In order to qualify for Daca, applicants under the age of 30 submit personal information to the Department of Homeland Security. Where do America’s undocumented immigrants live? They must go through an FBI background check and have a clean criminal background, and either be in school, recently graduated or have been honourably discharged from the military. In exchange, the US government agrees to “defer” any action on their immigration status for a period of two years. The majority of so-called Dreamer immigrants in the US are from Mexico and other Latin American countries.